John Kenneth Muir's Reflections on Cult Movies and Classic TV: Saturday Morning Cult-TV Blogging: Star Trek: The Animated Series (1973): "Once Upon a Planet"
Saturday Morning Cult-TV Blogging: Star Trek: The Animated Series (1973): "Once Upon a Planet"
The U.S.S. Enterprise returns to the planet colloquially known as “the Shore Leave planet,” where a humanoid Keeper tends to an advanced amusement park where visitors’ thoughts are transformed into reality. 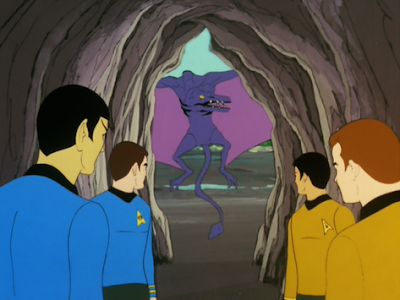 Unfortunately, Lt. Uhura (Nichelle Nichols) is captured by the amusement park’s master computer, leaving Captain Kirk (William Shatner), Mr. Spock (Leonard Nimoy), Mr. Sulu (George Takei), and Dr. McCoy (DeForest Kelley) to attempt a rescue. 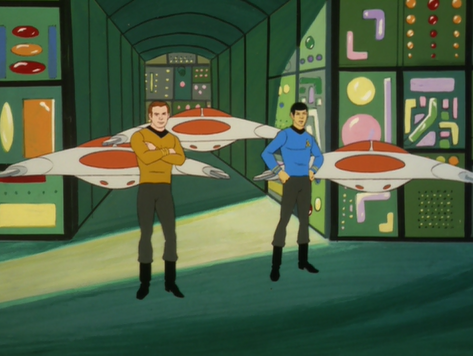 If the first half-dozen episodes of Star Trek: The Animated Series (1973 – 1974) are any guide, it looks like a distinct pattern is emerging. Original episodes are good -- sometimes scary good -- while the sequels to popular Original Series episodes are barely adequate, or even downright terrible. In other words, the planet is still producing hostile animatronic beings produced from human desires, wishes, and thoughts, and Mr. Spock still advises control and the careful “monitoring of our thoughts,” lest the landing party give “ammunition” to the enemy. 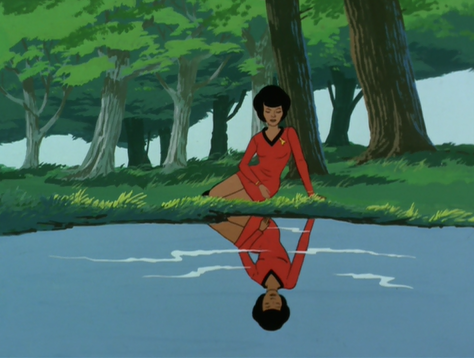 “Once Upon a Planet” isn’t a total failure, however, since it features a rare starring role for Lt. Uhura. The character gets to be the prime-mover of the story's "learning" arc, and that's refreshing. I also like that this segment involves the idea of a machine -- a master computer -- gaining awareness of itself, and its treatment by humanoids. Indeed, this is a concept that would be important, in one way or another, to the Trek franchise in installments as diverse as Star Trek: The Motion Picture (1979), and "The Quality of Life," The Next Gen episode concerning sentient machines called "exo-comps." Like, V'ger, the master computer in this episode sees the Enterprise as a kind of life-form ("the sky machine.") It also sees its life as consisting only of “servitude,” a word which might describe the exo-comps' predicament, since they are used in hazardous, life-threatening situations. 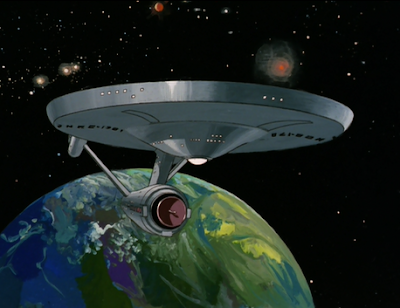 The solution to the crisis in "Once Upon a Planet" comes when Captain Kirk (once more) talks down a dangerous machine and reminds it that it need not go anywhere. Instead, “the galaxy will come to it.” The computer proves amenable to this suggestion. 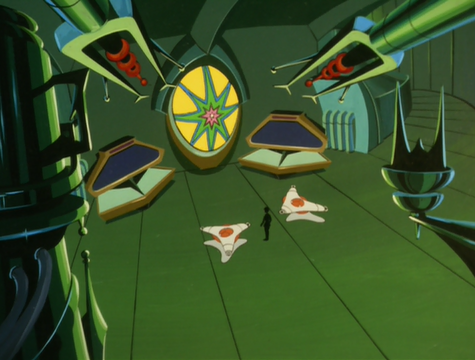 The problem with the overall story-line here is that the colorful, fanciful creations of the master computer are no more than narrative impediments to pad out the half-hour. 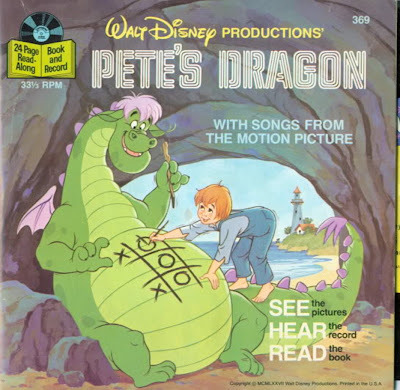 The fire-breathing dragons, pterodactyls, and even the Red Queen serve no other purpose but to slow things down, and, in point of fact, are not even avatars created by the landing party (as Kirk points out). They must be “pre-existing” amusements, and thus are present, essentially, at random. 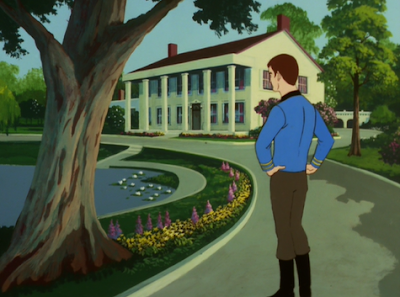 To describe this another way, "Once Upon a Planet" is a familiar story about a world run by a computer, and Kirk reaching an accommodation with said computer. The bells and whistles from "Shore Leave" play almost no significant or meaningful part in this sequel. So overall, the story isn't particularly exciting, or original. It's just average, familiar old Star Trek. Next week, another sequel: "Mudd's Passion." 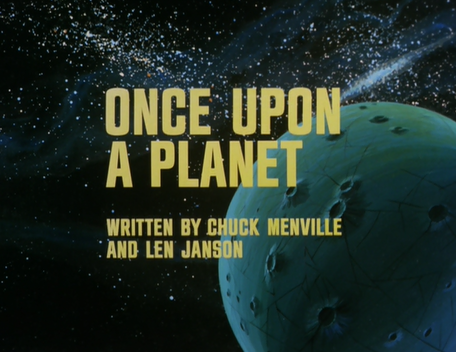 John, honest review of TAS "Once Upon a Planet" near miss sequel to TOS "Shore Leave".